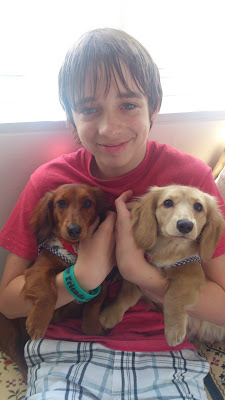 On his last full day in Japan, Luke had two surprises. 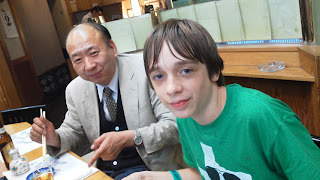 First, he got to spend time at Tsukuba University with a Hiragana tutor. 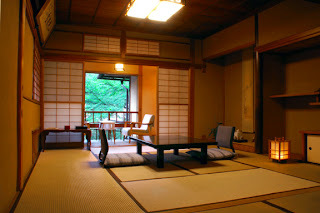 Hiragana is one of the two written forms of the Japanese language. You can see the "letters" and hear their sounds here. I don't have pictures yet of what he learned, but he assures me that he's bringing home two books to help him continue learning. He said it was "super cool" to learn to write Japanese, and that he has learned to speak a good bit of the language too. After all that hard work learning to write, Luke's hosts decided to surprise him with a "western style" meal. The young man to the left of Luke in the above photo is Mariko and Suzuki San's nephew. 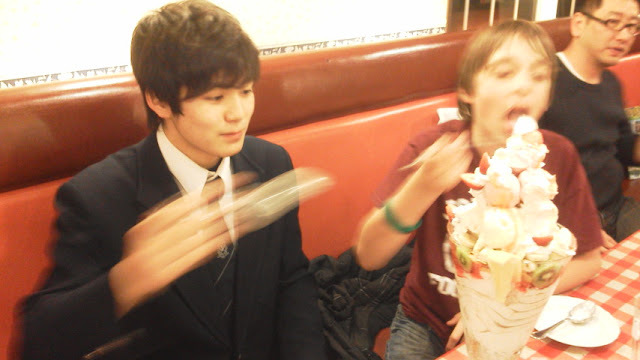 He goes to Meikei High School and is wearing his school uniform. 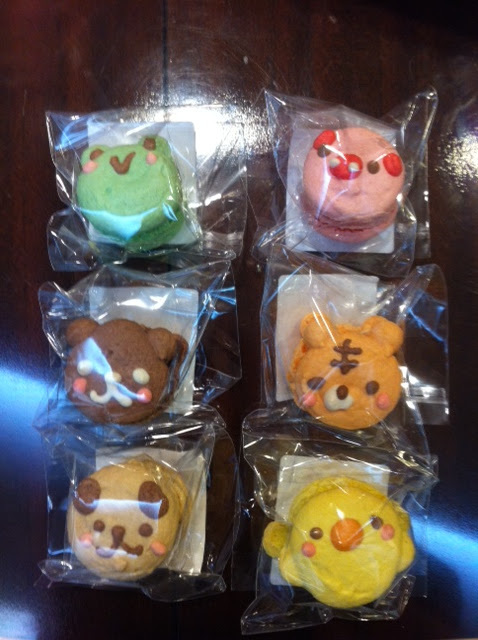 Do you recognize them from the little button guys that you can use on your phone? 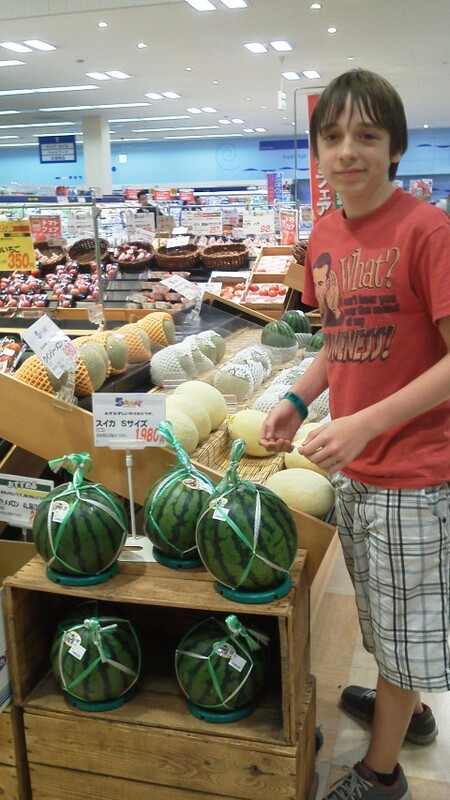 I don't know, but I kinda think that his Japanese Grandmom might be trying to spoil him just a little bit! 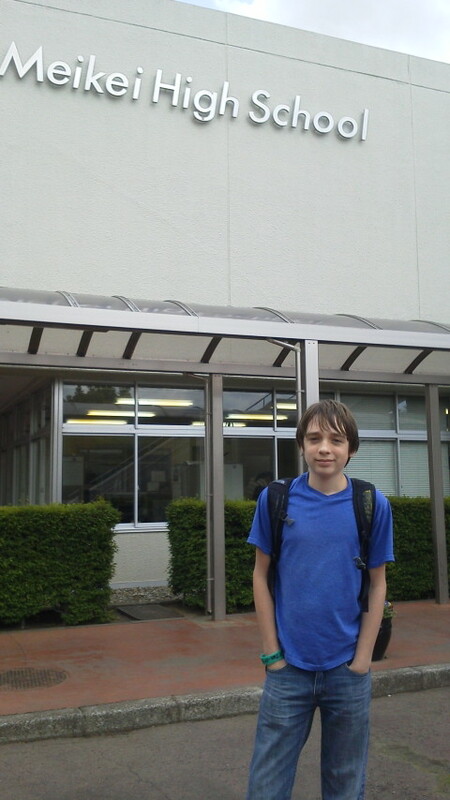 After his time conducting some high tech business meetings, Luke visited a prestigious private high school in Tsukuba, Meikei. This school is world renowned. About 200 of its students even LIVE on campus because their far-away families feel that it is that important for them to study at Meikei. You can read more about the school, see pictures, and learn a little about what it's like to live there here. The man you see pictured above is the English teacher at Meikei school. 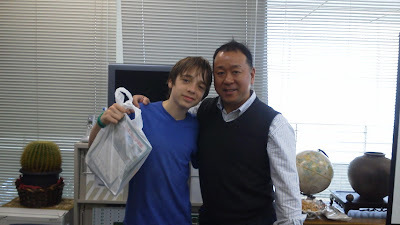 Luke spent some time with him and the 7th graders. One thing that Luke would have noticed right away, is that he was a bit underdressed. Japanese kids wear uniforms to school, whether they attend public or private school. This would mean button down shirts for boys and girls, nice pants for boys, skirts for girls and vests or suit jackets and ties. 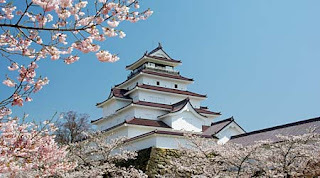 When you visit Japan, you are very likely to see lots and lots of kids in uniforms attending field trips. You can see in the photo that Luke has a backpack on. Elementary school kids in Japan get a VERY nice, very expensive, leather backpack for school when they begin first grade. It is a kind of rite of passage and meant to be an heirloom that lasts them through elementary school. Lots of people hang on to them as a souvenir of their childhoods. See those special backpacks here. 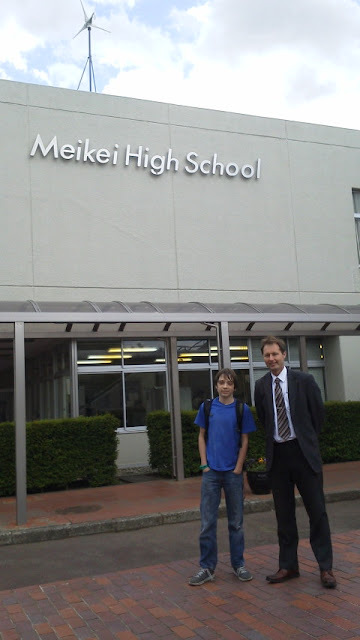 At Meikei school, Luke first introduced himself to the class and then took questions. He said that they were interviewing him because they will be writing a paper about his visit in English next week! The kids were all very surprised to hear that he was a homeschooled student. They had heard of this before, but had never met someone who was a homeschooler. It is not a very common practice in Japan. After his interview, Luke passed out some M&Ms, Starbursts and American Flag buttons and then joined them in taking their English test. He passed. Hooray! Luke said that he was surprised at first that some of their test words were not what you would expect from 7th grade foreign language studies. For instance "unaccustomed" and "jealous" were on the test. (You had to choose from a list of words to complete a sentence in English.) 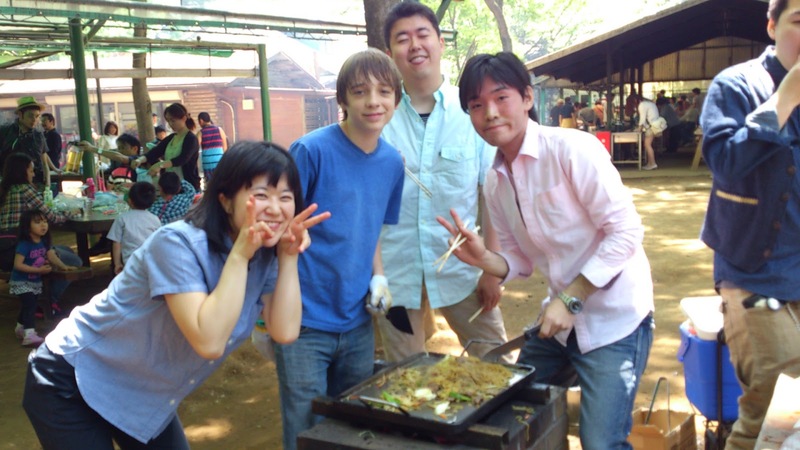 A few of the students have spent time living abroad with their families though - in Canada, America and China for example - so they are further along in their language studies than a typical American middle schooler would be. After English they went to the art room. Luke was so impressed with this. He said that he got to look at the end-of-year projects of some of the 10th graders. 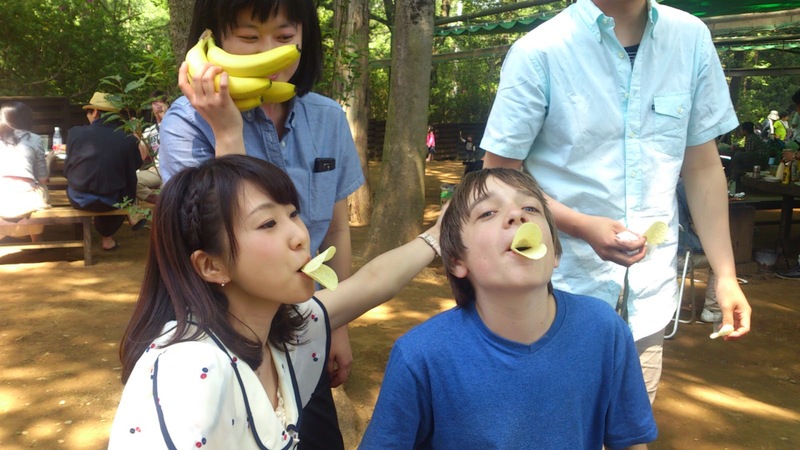 Their year-long goal is to study and recreate a masterpiece of their choosing. He said that he'd be hard pressed to tell the difference between the originals and the reproductions. He was particularly taken with one student's reproduction of a Boticelli piece. He said it was "ridiculously close to the real thing". Finally, Luke was able to attend a practice session of a Japanese sword fighting sport called Kendo. You can read about that here. Overall, Luke said that he was so impressed with the school and the students. It was a great experience for him. 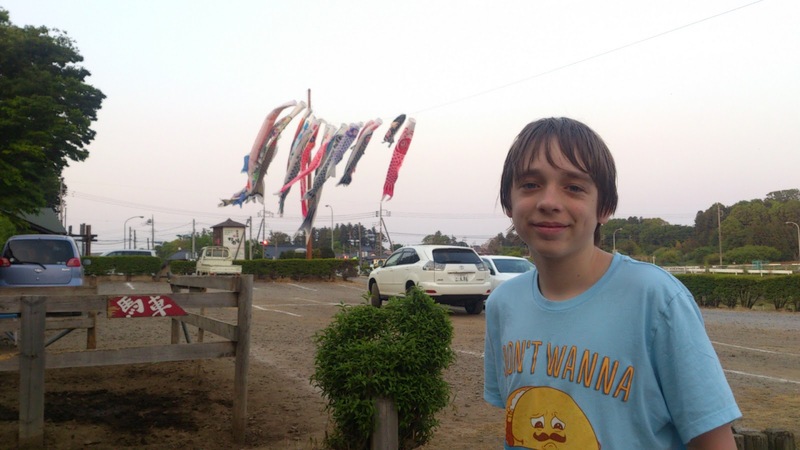 Funny though, isn't it, that the first time Luke spent time in a real honest-to-goodness school was in Japan? 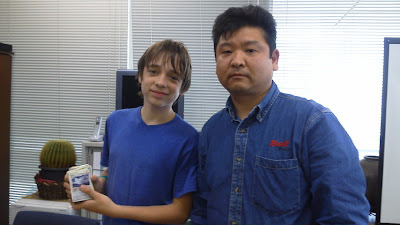 Part of the series of events that lead Luke to being able to take this incredible journey to Japan is that his Dad, Eric, worked for a Japanese circuit board sales company for many years. The owners of the company are Luke's hosts there now. 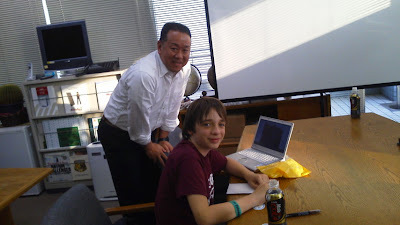 Luke got a chance to join them on Monday at the office where his Dad spent many hours working. To get to the office, he rode a train with his hosts. He's been on several trains while in Japan and is an old pro now. He said that one of the things that struck him most about his time there is how easy it is to get anywhere you want to go using public transportation. He said that the system is so well organized, and the maps and stations so clearly laid out that he felt confident that even a young kid who didn't know the language well could go just about anywhere alone. 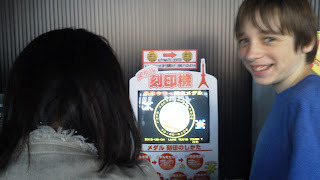 At the office, Luke was able to attend a meeting and get a little taste of the high tech business of Japan. Here he is with some of the other people that once worked alongside his dad. Ishii met Luke when he visited Austin a few months ago. He came with gifts for all of our boys then, and he brought more surprises for Luke during this visit to the office. 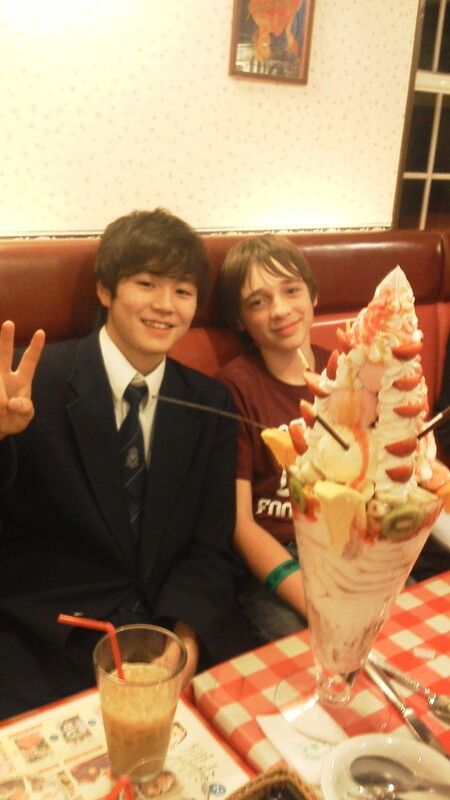 And here is Luke with Sagara (whose family spent time with Luke earlier in his trip). 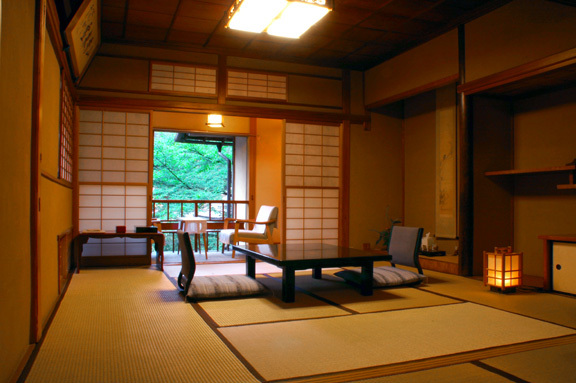 This gift trading is about kindness, and friendship, but it is also a tradition of sorts in Japanese business. Luke got to visit a fun sushi-go-round restaurant! 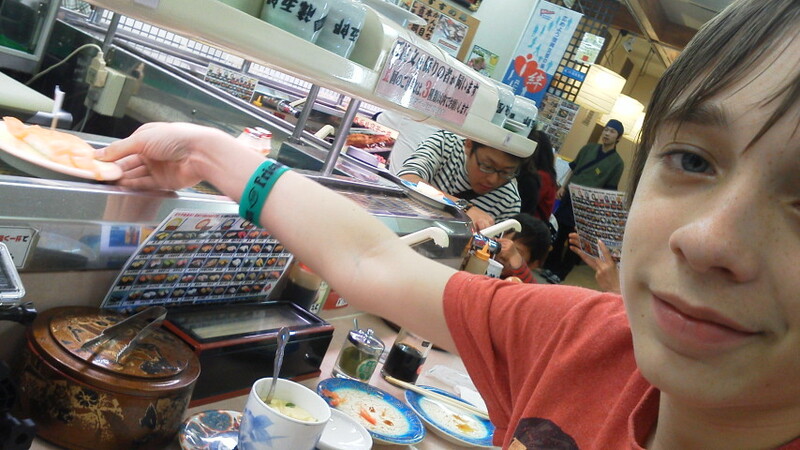 At these neat restaurants, the sushi circles the restaurant on conveyor belts in front of the tables. When you see something you like, you just reach out and grab it! 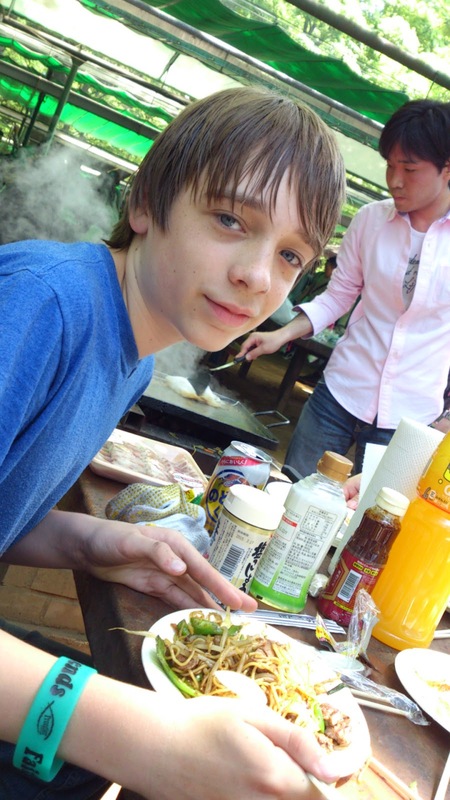 Does it seem like Luke is doing a lot of eating in Japan? They are very serious about their cuisine! You can read all about my experiences with food in Japan here. On Children's Day in Japan, Luke got to walk in the footsteps of his Dad, Mom and Nana. 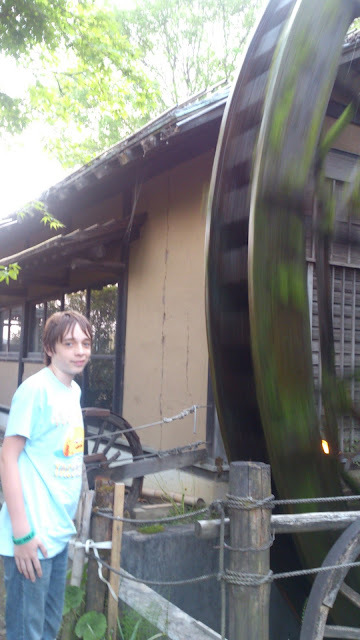 Each of us has visited the Soba Noodle Farmhouse, and once, many many years ago, Luke's Dad even took a "Flat Luke and James" (like Flat Stanley) for a visit there. We are trying to find pictures, but they are WAY deep in the archives! In any case, we all knew that he was in for a real treat. At this beautiful old farmhouse they make soba noodles with the help of a working water wheel. Soba noodles are made from buckwheat, which grows in the lush green fields of the Ibaraki prefecture. 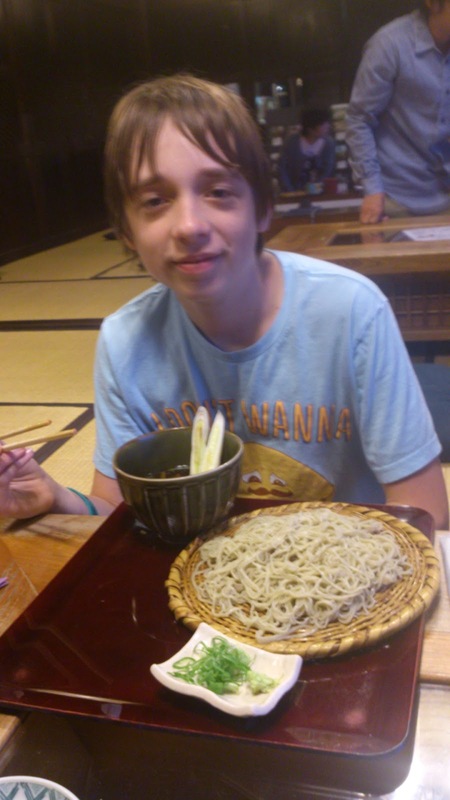 Luke is getting a lot of practice with those chopsticks! 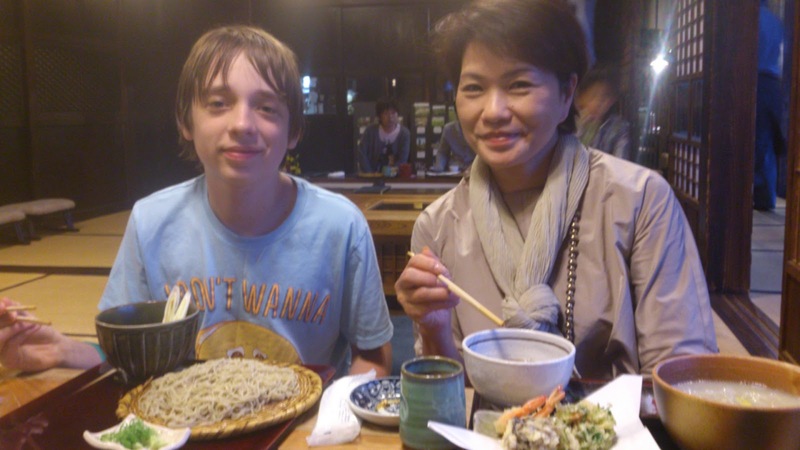 Here he is with his Japanese grandmom, Mariko. She is taking such great care of him! Looks like a satisfied customer to me! Here's a fun video showing how soba noodles are made. 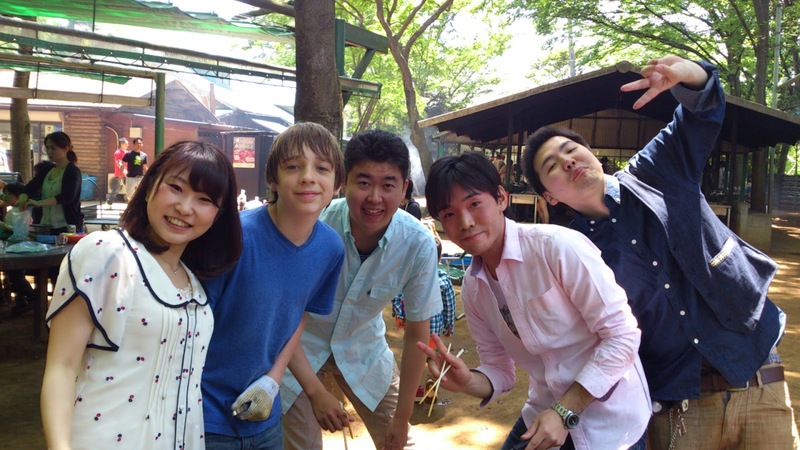 On Sunday, Luke took the Tsukuba express to attend a barbecue with Mariko and Suzuki's daughter, Miki. Miki is a television news journalist in Japan! This barbecue was a gathering of old high school friends, so it was a great chance for Luke to meet lots of new people. 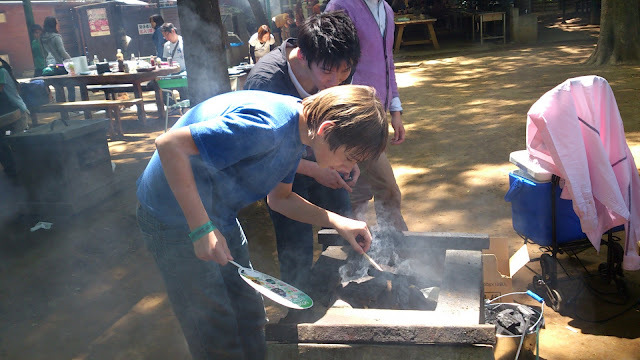 Barbecue food looks a bit different in Japan huh? Wait. Are those Pringles? 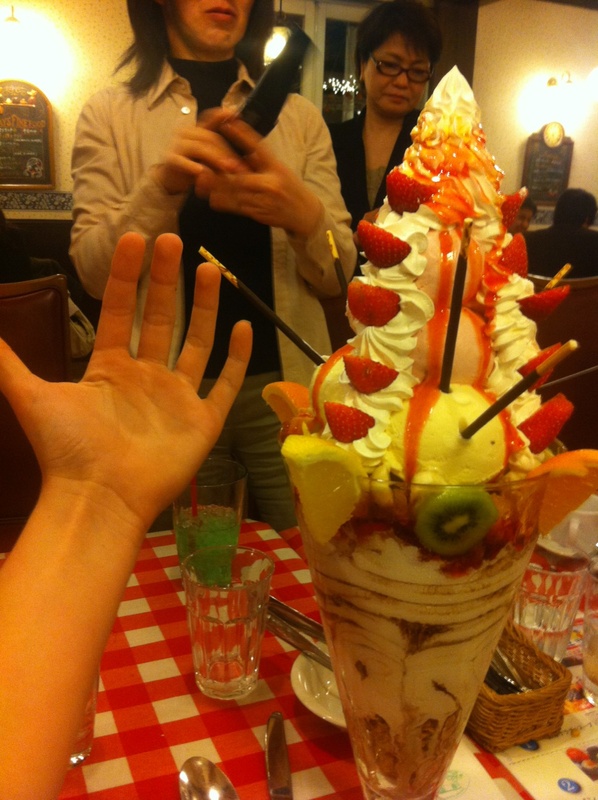 I wonder if they have different flavors than ours? I knew I'd see a vending machine eventually. 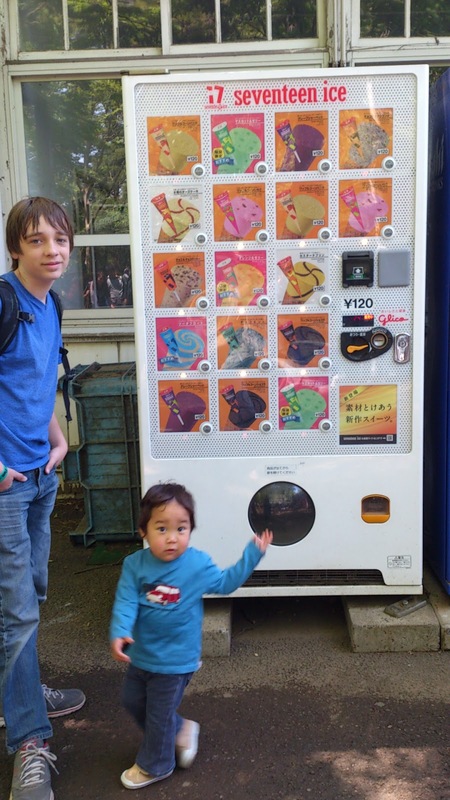 I love Japanese vending machines! Good friends, good food, lots of smiles and laughter... maybe Texas barbecue and Japanese barbecue aren't so different after all. 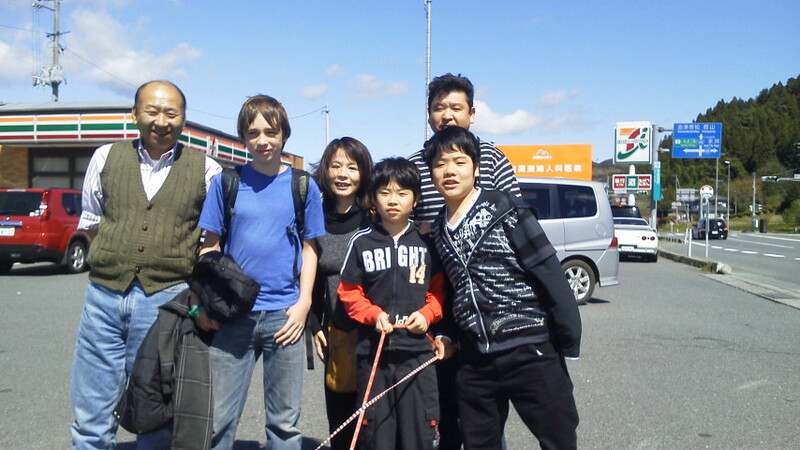 After Luke's time in Aizu with the Sagara family, they took him to the train station to head to Tokyo. 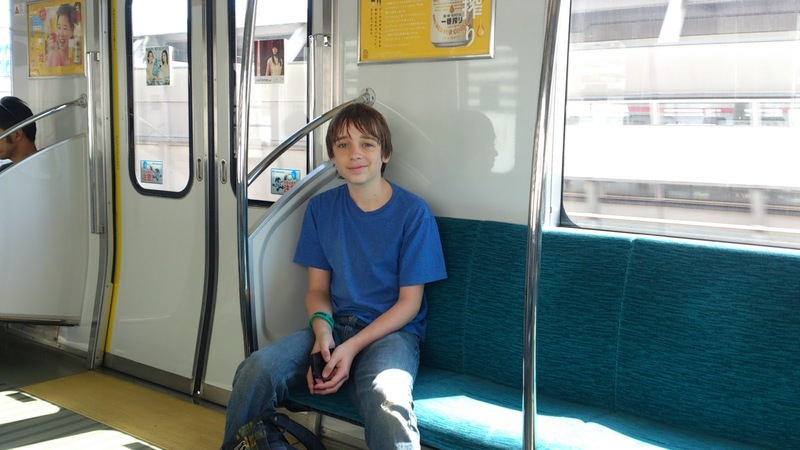 He got to ride the Shinkansen ( high speed bullet train)! You can read more about that here. 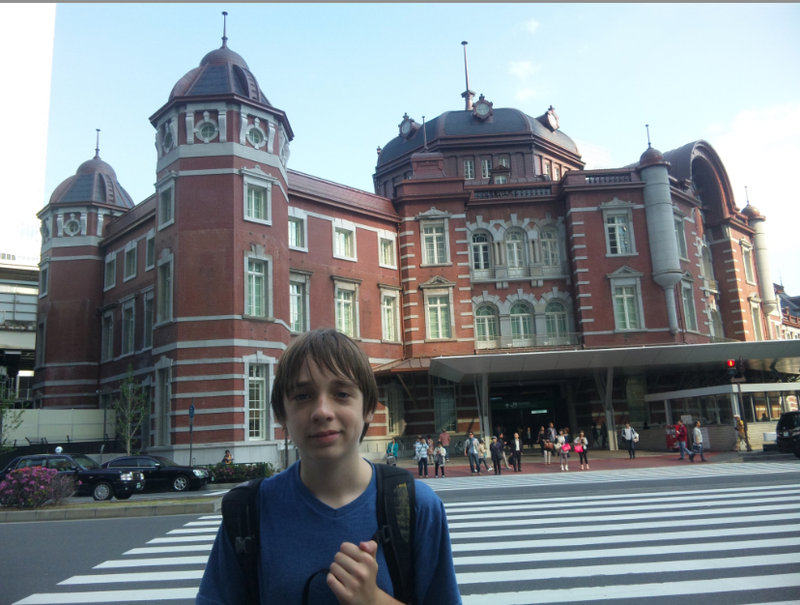 In just over an hour and half he arrived at the Tokyo station to meet Mariko and Suzuki's daughter Asae. From there they joined Asae's sister Miki and had some lunch. More noodles! With chopsticks! After lunch Luke got to see something really spectacular. The Tokyo Tower! 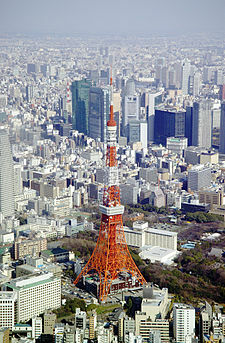 This radio/communications tower is very very tall and offers spectacular view of Tokyo. When you look out on this massive city (over 8 million people!) it is just breath-taking. You can read more about it here. Here's a blurry picture of Luke heading up to the observation deck. I don't care how blurry it is, I love to see that happy face! We've not been able to talk to him yet today, so we're not sure what all he did in Tokyo during the day besides the tower. 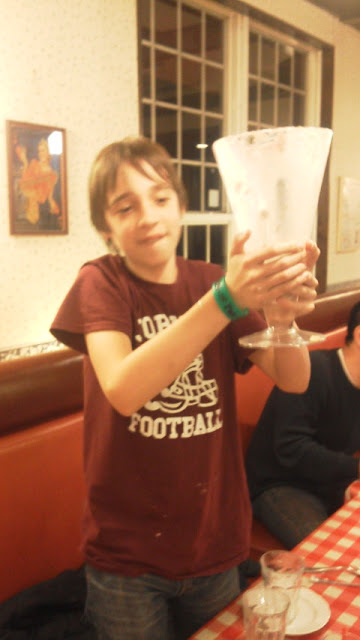 We do know that he ended his day with another amazing treat. He had dinner on a a Yakatubune ship in Tokyo Bay! The traditional boats sail around the harbor while guests eat dinner at tatami style tables. Afterward they can go out on the decks and enjoy the night lights of this beautiful city. 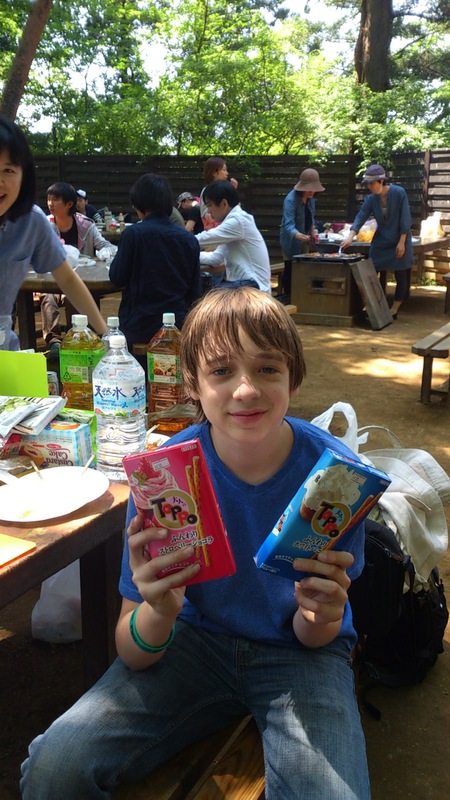 We have not yet talked to him today (and hopefully is fast asleep somewhere in Tokyo now), but by the looks of it, he's having an amazing time! 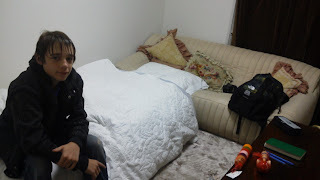 Here's Luke at Mariko and Suzuki san's house, very early on his first day in Japan. He learned right away that we weren't kidding about Japanese breakfast being different from American breakfast. He had noodles to start his day! After that, he headed out to meet some new friends. Mariko and Suzuki san took him to join their employee, Sagara, and his family on an adventure. Here he is with his new friends in front of a Japanese 7-11! It is "Golden Week" in Japan. A time when many holidays fall together, so lots of people take off work, travel and vacation a bit. Sagara and his family used their time to treat Luke to something very special. 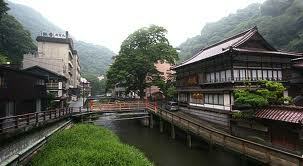 And also for Onsen (natural hot springs). Luke had a lot of fun playing in those springs with his new friends. 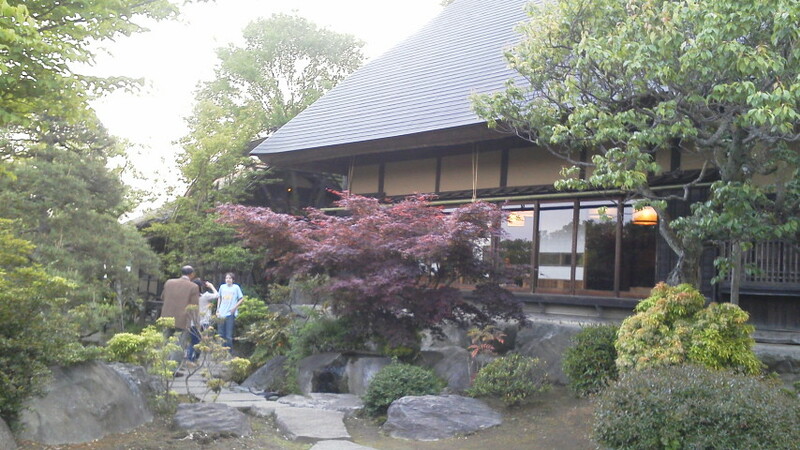 And afterward, they got to stay in a traditional ryokan hotel. Later, they come and take the table away and roll out comfy mats for you to sleep on. 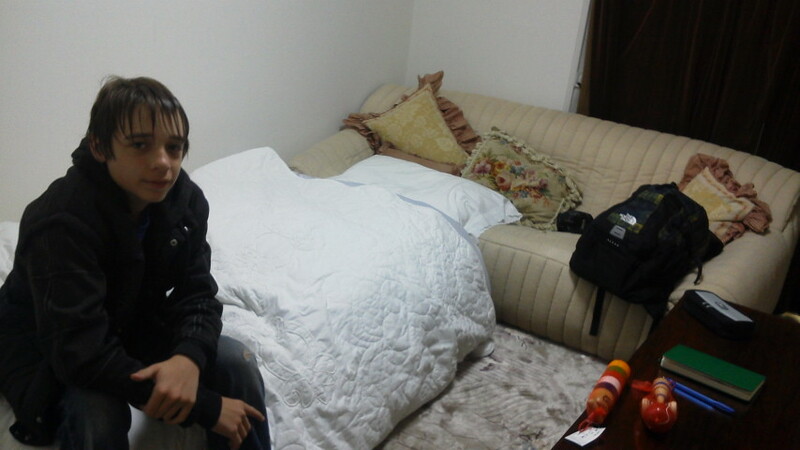 He called us and said that his friends didn't speak a whole lot of English, but they had a translator app. He said they were "super fun to hang out with" and that he was having a great time. In the background I could hear the boys giggling and playing. 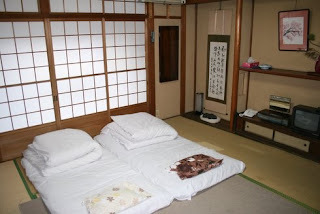 Sleepovers sound the same in Japan as they do in America! He also said that they boys really liked their presents. Their favorite part? The Nerds candy! Very early in the morning, while it was still dark, we piled in the car to take our Luke to the airport. At long last, the day had come. We were all equal parts excited and nervous! 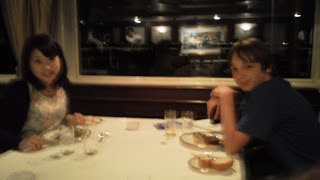 At the airport, we all got passes so that we could walk him to the Admiral's club. We had breakfast with him and then said some teary goodbyes. It was HARD to leave him there! So very many people had let us know though that they and their families were praying for him to be brave, safe and to have a wonderful time. I know that gave him great courage and US great peace! As nervous as I was for him, I was also excited for him to see and feel and know in such a big way that the source of his strength is an ever present God. At home we gathered around the flight tracker and watched for his plane to take off and land again. Then we waited, not so patiently, to hear that he had ridden the tram in Dallas and found his way to his next flight. There were no sweeter words than, "Hey mom! I'm in my seat!" It was a LOOOOOOONG day after that though. For 13 interminable hours we watched as his plane, so little on our screen, travelled across the globe. 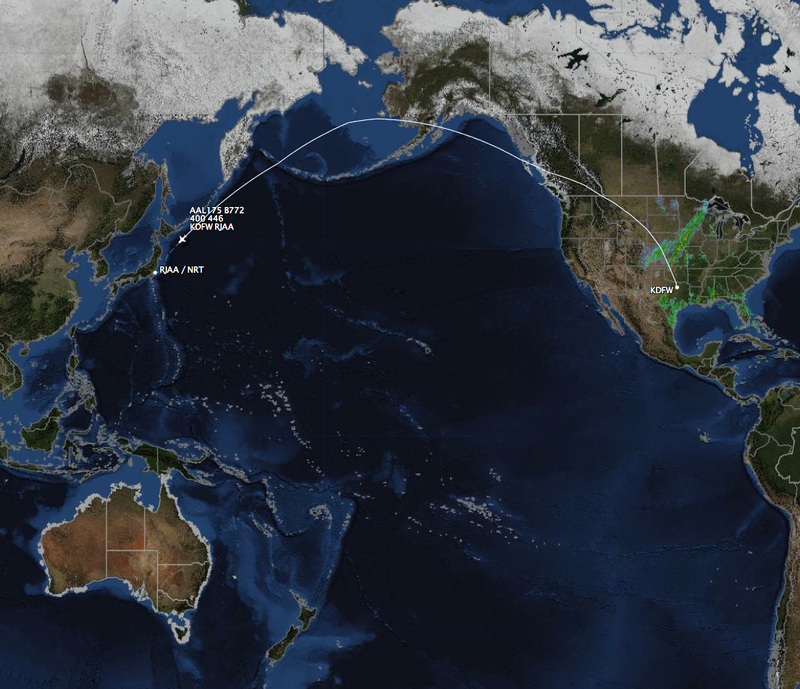 It just amazed us to think of him going 560 miles an hour, 38,000 feet in the air, over Canada, Alaska and Russia. To think that he travelled over 6,000 miles! We spent a lot of time looking up Google earth views and wondering if he could see those things from his window. 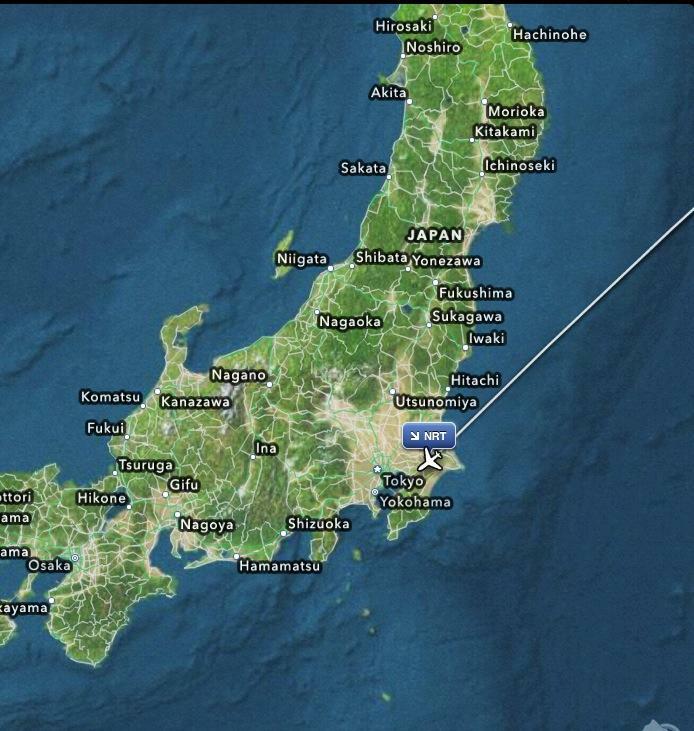 We clapped as he left the country and then again when he crossed the International Date Line. What a wonder! By midnight, we were all so exhausted but could not go to bed without hearing his voice and knowing that had safely landed and found our Japanese friends. At about 12:45, we finally got the call. He made it! His first stop after that? A very tired James, clearly missing his big brother, crawled into Luke's bed to sleep.